Looking for a croppin' good time? We've combined two of our favorite activities, scrapbooking and a cruising, to offer you an unbelievable CROP N CRUISE CROPPING experience - A SCRAPBOOKING CRUISE! Look where you can go on a scrapping cruise. Click on the destinations on the left or at the bottom of this page. We give you the most bang for your buck. On all our CROPPING CRUISES, you get more SCRAPBOOKING AND/OR STAMPING workshops and classes, more goodies, more prizes, more opportunities to create lifetime memories, great instructors and have plenty of time to enjoy the ship and port cities. 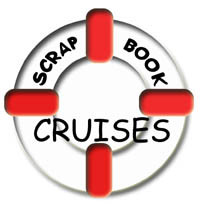 OUR SCRAPPING CRUISES OFFER YOU THE MOST SCRAPBOOKING WORKSHOPS, TECHNIQUE CLASSES AND GOODIES. Picture yourself surrounded by beautiful works of art, sampling gourmet dining, being pampered as you deserve to be. Imagine yourself sunning on a tropical beach, visiting exotic destinations, and shopping in duty free shops. Entertained nightly by Broadway and Las Vegas styled shows, productions, musicians and performers. You'll learn the newest scrapbooking techniques. Win prizes for page layouts. Take home new products. Time to get your books caught up or start new ones. On select cruises, a private room will be available for 24 HOUR NON STOP CROPPING . Go home with finished pages, filled with wonderful memories. All SCRAPBOOK CRUISES feature goodie bags and complimentary amenities such as: our private cocktail party, formal photo, shipboard credit, and included shore excursions. Amenities vary depending on SCRAPBOOKING CRUISE and destination. Because of the exclusive nature of our SCRAPBOOK CRUISES, to participate in any of our SCRAPBOOKING AND/OR STAMPING CRUISES you need to book your CROPPIN' CRUISE with us, Days Off Travel. All scrapbook workshops/classes and CROPPING N CRUISING EVENTS are exclusively developed and organized by Days Off Travel. Scrapbook workshops/classes and other events are not organized by any other agencies or the cruise lines. Join us when you want the ultimate in a scrapbookin' cruise. 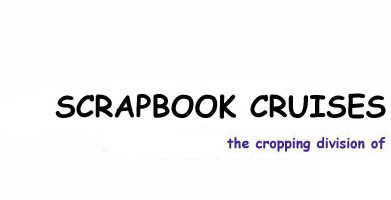 Call it what you want: a CROP CRUISE, CROP N CRUISE, CROPPING CRUISE, CROPPIN CRUISE, CROPPIN' CRUISE, CROPPING CRUISE, SCRAPPING CRUISE, SCRAPPIN CRUISE, SCRAPPIN' CRUISE, SCRAP N CRUISE, SCRAPBOOKING CRUISE, STAMPING CRUISE, STAMP CRUISE, STAMP N CRUISE, STAMPIN CRUISE , we offer the most destinations, and dates than any other travel agency. Cruise aboard the luxury ships of Celebrity Cruises, Royal Caribbean International Cruise Line, Princess Cruises, Norwegian Cruise Line and Carnival Cruise Line. Come join one of our scrapbook cruises and CROP AND CRUISE with us. Don't be left out!